Forget all the classic mashups from years past. 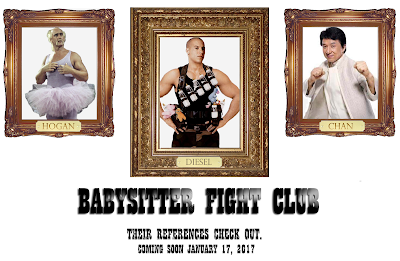 Mothra vs Godzilla, Freddie vs Jason, last year's Transformer's vs GoBots, Babysitter Fight Club is the craziness we've all been waiting for. 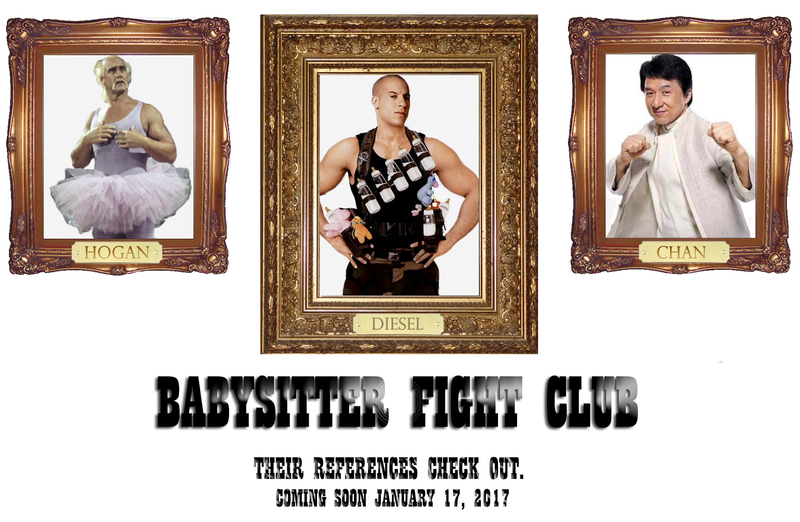 Directed by Jet Lee and starring Vin Diesel, Hulk Hogan, and Jackie Chan as rival babysitters vying for the same job, it's everything you'd expect from that setup, and so much more. Elisabeth Shue plays the mother (bit of a stretch given the age of the children) of two small kids, aged 12 and 6, who's remarrying and looking for someone to watch the kids for a couple weeks while away on their honeymoon. When three competing services send over their best sitters, Shue decides to give them each opportunities to win the job by sitting for her as she handles the wedding preparations. You can well imagine that hilarity ensues. For Shue, her role is almost an homage to Adventures in Babysitting, but it's very limiting. The real focus belongs to the trio of overly competitive babysitters who'll do anything to sabotage each other. Diesel plays an ex cop who, after getting shot, hasn't been able to return to duty out of fear. He's really the focus of the film and we're made to empathize with his plight. Jackie Chan is an immigrant who brings his culture's child rearing sensibilities to the US. He also teaches the children martial arts. In one hilarious scene, the 6 year old girl Sadie beats down the neighborhood bully before telling him to "stop the hate". He's played up as pretty stern but with a melting heart. For Chan, much as I love him, his character is probably the weakest written of the group. Perhaps the real winner of the film is Hulk Hogan who's apparently been hiding a previously unknown reserve of acting prowess. Rivaling that of Mickey Rourke in the Wrestler, Hogan is a man beaten by life, who after years of neglecting his own kids and wife has found himself alone. Trying to piece together his life, he finds himself connecting to a part of himself through the children he thought was dead. As touching as that sounds, you're here for one reason: to watch these guys beat the crap out of each other. You will not be let down. Jet Lee worked hard to make sure that the three different fighting styles of these action stars are all well represented. In one particular scene there are diapers being hurled through the air like ninja stars, baby powder being used like a smoke bomb, and a stroller being bandied about like a folding chair in the center ring. Yes it's slightly unbelievable, but this is hardly the type of movie you go to see because you expect it to be grounded in reality. There's even a brief cameo which, if the trailers hadn't already ruined it, I wouldn't mention for fear of spoilers. Arnold Schwarzenegger in a hilarious throwback to Kindergarten Cop, does indeed appear as a kindergarten teacher at the school where Sadie is preparing to start in the fall. The film however is not perfect and suffers from a disappointing third act. The climactic fight, is well, frankly not so climactic. After the awesomely choreographed scenes earlier, it seems a let down. But don't let that dissuade you from seeing the movie. It's a delightfully written script that will leave you laughing, crying, and rooting for babysitter on babysitter violence. In the best of ways it's the expendables of babysitting movies. In short, for Diesel and crew, it's the roles they were born to play. How in the world did you come up with this! This wouldn't surprise me too much. So level with me, okay? You've actually written a screenplay for this, right? Thought about it in the deepest, most perverse place in my heart, but then I decided to write the review instead.